A £138m home improvement programme by one of the region’s largest housing associations, County Durham Housing Group, has transformed 24 bungalows in Croxdale. The homes, in Windsor Court, have all received major improvements including new kitchens, bathrooms and rewiring as part of a major investment by County Durham Housing Group. Some homes have even had changes to their internal layout such as removing outdated pantries or creating wet rooms. Work on the final few bungalows in Croxdale is now approaching completion, with external footpaths also being resurfaced in the area. 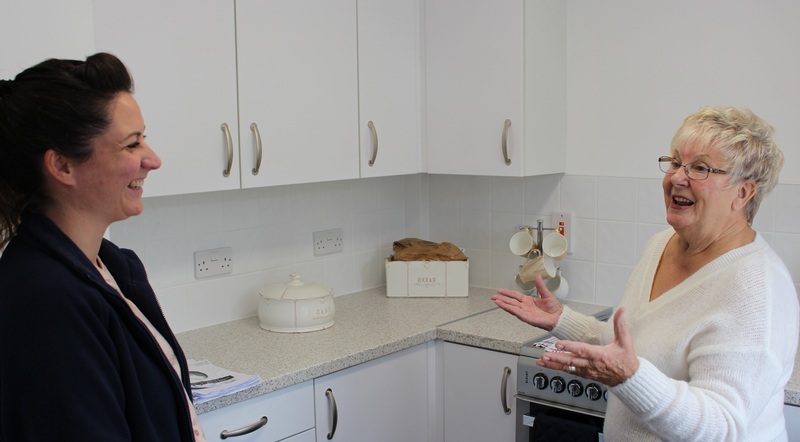 Pictured above from left to right are Claire Hauxwell from County Durham Housing Group with Mrs Brodie in her new kitchen. The 10-year improvement project will make homes cheaper to run and ensure high-quality affordable housing provision in scores of communities stretching from rural Weardale to the coast. Neighbour, Sandra Galloway, said: “When I had the knock on the door about the work I was going through a bit of a bad time, but everyone was so helpful. I can’t fault anyone who’s been involved. County Durham Housing Group Investment Programme Manager, Kim Tillotson, commented: “The improvements we’ve been carrying out to these homes in Croxdale have been pretty major. But throughout the whole programme we’ve been keeping in close contact with tenants and doing all we can to minimise disruption. Work has already been completed on homes in Bearpark, Brandon, Ushaw Moor and Willington. The refurbishments are being carried out in partnership with specialist contractors ENGIE. ENGIE was awarded the £138m contract by County Durham Housing Group following a competitive bidding process based on value for money and quality. The company, formerly known as Keepmoat Regeneration, has a long and successful track record of working in the area and extensive experience of delivering major projects, while minimising disturbance to residents.